If you have already decided to visit The Royal Green Jackets (Rifles) Museum, the information below will help you. If you are planning to visit Winchester, you should include a visit to our Museum. The average length of a visit to the Museum is from one to two hours. 25% of our visitors spend longer. Visitors of all ages, especially children, are welcome. Take a look at our facilities at the museum. 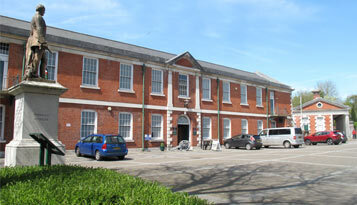 The entrance to Peninsular Barracks from Romsey Road. The Museum is easy to find adjacent to the Great Hall and within 100 metres of the High Street and the West Gate. The Guildhall, the Cathedral and the mainline railway station are all within 10 minutes’ walking distance. Lots to see. The diorama of the Battle of Waterloo is absolutely fascinating and our tickets covered us for the whole year. Definitely coming back.